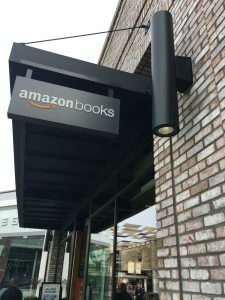 When Amazon announced they were opening brick and mortar bookstore locations, I don’t think anyone expected them to literally be brick and mortar. Comedy, Amazon. I like that. But the outside brick facade is where the traditional bookstore experience ends. Inside the store is a new customer experience. Amazon doesn’t go as far as redefining bookstores, but they are trying. What do we expect when we go into bookstores? For me, I’m from a small college town in Northern California. I grew up with cafes and local bookstores everywhere. They’re probably part of my DNA at this point. So when I go into a bookstore, unless I’m on a mission for something specific, my goal was to escape by surrounding myself with books, coffee, and knowledge. I would grab a coffee, find a stack of books, claim an armchair and forget about the world for an hour. Put all thoughts of a traditional bookstore out of your head. 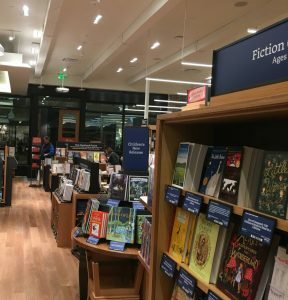 This is a place, where Amazon has created a bookstore experience closer to a retail store than a traditional bookstore. It is a place to walk through, to review books, to touch and feel Kindles, check out Echos, talk to Alexa. There is no coffee, there is are no chairs, and there is no room for lingering. In some ways, it is a real-life continuation of their online brand experience. Small space. The store is smaller than a typical mall bookstore and stocks around 6,000 books versus the typical bookstore which can have three times that many. However, the books were selected with Amazon’s deep data and included a local feel to them with sections like, “local writers” and “Popular in San Diego”. Show me your face. The books are stacked facing out with a set amount of space between them. Aesthetically it’s appealing, giving each book room to breathe, and customers a chance to really see the books, not just those that are featured. Tell me all about it. Every single book has a shelf card under it that include the barcode, number of reviews and stars the book has received. Using your Amazon App, you scan the barcode or book cover, and it tells you the price, reviews, etc. Some shelf cards include quotes from reviewers. I doubt reviewers realize that their words have been added as selling points for books. Surprise! You’re on an Amazon Bookstore review card. Let’s talk about price. “Do you have our App?” is possibly the second most asked question by salespeople. The first being, “Do you have Amazon Prime?”. The reason for this is that Amazon Prime members pay what the book is listed for online, non-members pay the price listed on the book. Suddenly you’re more interested in the benefits of Amazon Prime when you see you can save up to 40% off the book price? Go figure. Cash doesn’t pay. The store is cashless. Once you select your books, you get in a line to pay. While I was there a man began complaining loudly about having to stand in line. There was one person in front of him. He waited less than two minutes to pay. As a societly, we’ve become extremely impatient. Organization. I found the organization of books (both the categories and the lack of alphabetizing) somewhat confusing. I’m sure there is a deep data logic that drives the organization based on store traffic patterns, etc. but it didn’t make complete sense to me. In addition, there isn’t much space between the shelves so if one or two people were in a row, I found myself walking to the next one to go through rather than brush uncomfortably close to strangers. Why Open Retail Locations Now? The business strategy for the bookstores remains somewhat unclear to outside analysts and journalists. There are a few theories, though. In the year or so since they opened the first location in Seattle, Amazon has had enough time to gauge the success of the store and continues on their plan of opening more with locations in Boston and Chicago coming soon. In this case, “success” is not necessarily defined as the number of books sold, but also how many people sign up for Amazon Prime at the locations. That is how Amazon begins wrapping you further into their ecosystem. Experts who have reviewed the model include Wharton management professor, Daniel Raff. This follows the trend in the past few years of etailers like Warby Parker building out physical stores to allow customers to experience the brand and become more familiar with their products. Another theory found on Forbes.com focuses on decreasing Kindle sales, looking specifically at Millennials. Surprisingly, Millenials show an increasing preference for printed books. The thing with the Amazon Bookstore is that while it does provide the tangibility of books and technology, it doesn’t allow for the connections Millenials like to make. There isn’t room for them, not in the store nor in the App. This isn’t a place for discussion, conversation, pour-over coffee, craft beer, knitting, reading, or author visits. It is a place for books, technology, and transactions. I will give them that the books are selected and curated using the vast amounts of data Amazon has. Lastly, because this is a marketing blog, I have some marketing advice for Amazon. Connect the data, drive conversions. For as wired in as Amazon is, I used my app to scan a few books in the store. When I got home, I fully expected to see those books highlighted on my Amazon home page. But they’re not. Here’s a hot tip, Amazon. Just because I didn’t have time to make a store purchase, doesn’t mean I don’t want the books. You already know I was interested in them and didn’t buy the books… market them to me! Be authentic to your brand and your technology. You’ve got the power to make this happen, Amazon. Let’s see you do it! Consider your audience. In the business section, there were several books about women leaders and women in business. Go Amazon. The catch? One of the most prominent books about women in business was on the top shelf. I’m 6’ tall and while I could reach, it is out of reach for most women. Books aren’t alphabetical (fix this as well, it’s confusing! ), so why place a book for women so far out of reach? It’s like most C-level positions. Or the presidency. Why rub it in? Let’s talk about awareness. I’m a Prime Member and I live in San Diego. Why didn’t information about the store reach me? I found the storefront because I happened to be going to the Apple store to get a new charger for my laptop after my puppy chewed mine. Unless you don’t care who goes into the store. Or you don’t care about reaching people who are already Prime Members. If that’s the case, then that is a case for the business strategy to focus on increasing Prime memberships. Either way, the lack of marketing around the location was surprising. Overall, the Amazon Bookstore customer experience is my first physical connection to the brand I’ve come to rely on over the years. I’m not sure if the store is the physical experience of the brand that I expected. However, all of this said, I was still impressed by the location and the technology driving it. Time will tell if they last and prove to be a profitable strategy.